Saudi Arabia is rattling the oil sector with a price war that many think is aimed at U.S. oil producers. But there’s an easier price war to win: with Canadian tar-sands operators. Saudi Arabia is rattling the oil sector, and that’s bad news for some of the most popular oil stocks on the market. Last week, the leader of the Organization of the Petroleum Exporting Countries (OPEC) – the oil cartel that has effectively set the oil price for decades – raised the export price of crude oil to Asia… but cut the export price of crude oil to the U.S. The market went crazy. Oil prices slumped to multiyear lows. News outlets everywhere shouted that Saudi Arabia was taking a shot at the U.S. shale boom. But they’re wrong. While it’s true that U.S. shale companies will be affected by low oil prices, Saudi Arabia is actually threatening Canadian oil producers. As regular Growth Stock Wire readers know, new drilling techniques have allowed the U.S. to tap into vast oil and gas reserves locked away in shale. This sent U.S. oil production soaring 63% from the low in 2008 to today. That’s a massive increase in a short period of time. The “tight oil” coming from U.S. shale is light, sweet crude oil. What our oil refiners really want – what they were set up to run – is the heavier, sour crude oil… the kind that comes from Canada and Saudi Arabia. That means the U.S. still imports crude oil from Canada and Saudi Arabia. 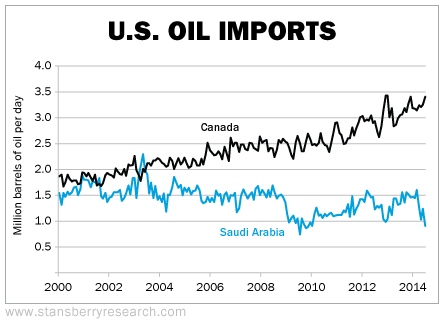 But over the past few years, the U.S. has been shifting from importing oil from Saudi Arabia to importing oil from Canada. From 1994 to 2000, Canada and Saudi Arabia were roughly equal in terms of oil exports to the U.S. But as you can see from the chart below, since 2000, the U.S. has looked more to Canada than the Saudis for oil imports. Over the past few years, this reversal has really shown. In 2013, the U.S. imported an average of about 1.3 million barrels of oil per day from Saudi Arabia. In August, that fell to just 894,000 barrels per day. That’s a 31% decline in imports. Meanwhile, the U.S. imported 3.1 million barrels of oil per day from Canada in 2013. In August, that number went up to 3.4 million barrels per day. That’s a nearly 10% increase in imports. So a lot of the imports the U.S. cut from Saudi Arabia are now coming from Canada. For Saudi Arabia, this has been a huge hit to its sales. It’s hard to find new buyers for crude oil right now. So Saudi Arabia is taking a shot at Canada because it knows it can likely win a price war. Much of Canada’s crude oil comes from tar sands. The tar sands are full of thick asphalt-like bitumen. To extract oil, tar-sands producers have to dig up bitumen and run it through expensive processing facilities to produce quality crude oil. That’s much more expensive than conventional oil production in Saudi Arabia – which essentially consists of sticking a straw in the ground and watching oil gush out. Because of these high costs, tar-sands companies have thin profit margins. When oil rises, these thin margins can soar… and share prices soar with them. But when oil prices fall, this leverage works the other way, and share prices can plummet. The best tar-sands companies need to get $50 per barrel for their oil to break even. The rest need between $50 and $90 per barrel. Today, a barrel of bitumen sells for just $56. So many tar-sands companies are losing money. And the best ones are watching their profits get squeezed. The squeeze is already affecting these companies’ share prices. Many are down low double-digits since June. And with Saudi Arabia pushing down the price of oil, profits – and share prices – are going to fall even more. During the global crisis in 2008, the price of oil plunged. It ended up falling nearly two-thirds from the start of 2008 to its bottom in 2009 at $34 per barrel. The decline nearly killed the oil sands sector. For example, let’s look at tar-sand giant Suncor. Suncor is one of the top 20 largest energy companies by market cap. It owns refineries in Canada and a small amount of oil production around the world. But its main business is in the tar sands. In 2008, Suncor’s average sale price of a barrel of bitumen was $90. In 2009, the average price dropped to $54. Suncor’s results of operations (results of operations is a metric used by Bloomberg to measure the profitability of operations) fell with the bitumen price from C$3 billion in 2008 to less than C$700 million in 2009… a drop of more than 75%. Other tar-sands companies fared even worse. Shares of mid-sized tar-sands operator Opti-Canada fell from $25 in 2008 to just $0.12 in 2009. That’s a 99% decline. In 2008, Opti-Canada’s market value was $4.5 billion. But in 2011, the company was acquired by giant Chinese oil company CNOOC for just $38 million. Oil prices would need to stay low for a while before we see that kind of selloff again – especially in tar-sand giants like Suncor and Canadian Oil Sands Trust. But with Saudi Arabia essentially starting a price war with Canada, I recommend saying out of Canadian tar-sands companies right now. By Matt Badiali, Growth Stock Wire. This is a very intelligent and enlightening report. So, it seems as though the Saudis are “smelling blood”, and their intelligence report conclusions has realised that they can win this petro-supremacy war by crushing the viable oil price for both the US and Canada Shale and Sands projects. (Two birds with one stone)! I also think because of this report, that the Keystone project was also seen as an increasing threat to them: They believing, that eventually, the US government would cave in to corporate and national interests as international oil imports are threatened due to US military and political operations abroad. I project that this report tells us that the OPEC alliance will soon break up as either the US abandons its Arab allies or as OPEC abandons the dollar hegemony. Oops! It looks like I had an oversight! It is not only the Keystone project which the Saudis are aiming at, but the East Energy Pipeline Project! Here is some news for all of you that many may not even know about. Delta airlines has the refinery in trainer PA and relies on the crude from these Tar sands . Same with the PBF refinery in Delaware City DE Which now has expanded its off loading facility to accept 2 120 car trains a day and Norfolk Southern has invested millions in laying down miles of new track in the area of the refinery and upgrading the crossings in the area in DE over the past 2 years to expedite these trains trough so they do not tie up traffic. PBF Energy re opened this refinery several years after Valero shut it down and sends some if this crude by barge to its other refinery up river to Paulsboro N J which Also gets crude by Train. The refineries in the Phila area that where suppose to shut down several years ago have remained open thanks to the Bakken and mostly Tar Sands crude. These refineries are the Largest consumers , refineries in the entire U S of Tar Sands crude. 2 years ago at least 5 I know would have shut down and the price of gas would have been higher than CA with spot outages of gas. It is now to the point where CSX and NS are begging SEPTA which owns the regional rail line to let them use it during the day to move more crude trains down to a storage facility for oil along its Airport line. They Said build another Freight line next to ours and you may do what you want. The passenger trains run every half hour to/from the airport . It takes the crude trains 23 mintutes to cover the 4 miles to get to the area they need and have 1 a m to 4 am only. It is getting crazy on the rails on the east coast people. Matt, I posted your comment on the front page, right column. Cheers. I have no information to add just want to say that your comment was awesome. Thanks to Wolf and Matt for this glimpse behind the curtain. Saudia does not control oil prices any more than Exxon-Mobil, oilcos are price takers not price makers. If refiners cannot make money they do not buy crude; the refiners customers are flat broke and cannot buy more expensive refined products. It isn’t just the US — where retail is collapsing and 50+ millions are on food stamps — the faltering customer is unraveling Japan and China economies as well. Without the Western customer-of-last-resort borrowing there is less $$$ collateral for Far Eastern currencies, this in turn causes currencies to depreciate. This depreciation by itself represents diminished demand. Right now, customers are going broke faster than drillers. What this means is Saudia can do what it pleases with regards to production and the outcome is more bankrupt customers and falling prices. This dynamic feeds on itself as low prices = less credit for drillers and tar sands producers => less fuel output => more customer failures => more stress on drillers. Oil crisis in 2014 does not take the form of gas lines or odd-even days, it takes the form of credit failure = see ‘Japan’. Thank you. I’m tired of the endless complicated explanations for oil’s price decline. Why cant anything occurr for obvious reasons? We all know demand is disappearing, and that translates into oversupply. Producers can’t reduce output easily or without consequences, so they keep ramping up production until this happens. Simple.